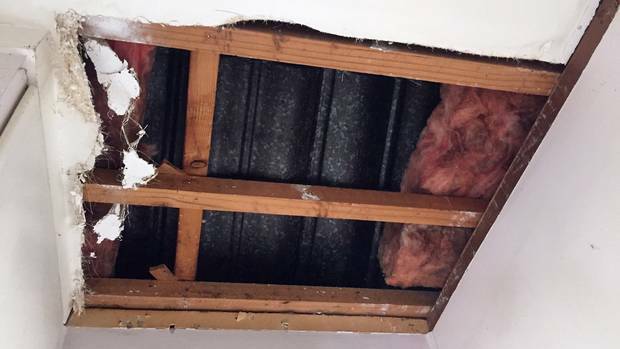 An 82-year-old woman has allegedly been scammed out of almost $9000 by fake tradesmen, who claimed they would fix her roof but instead left a hole in it. The man - who was with two other guys - told Leonard they would not only fix the tiles on her roof but also install two dehumidfiers inside her home. Leonard said she had lodged a complaint with police. However, police are yet to confirm this to the Herald. Nearby neighbours of Leonard's, Des Carville and Fale Opapo said the men also knocked on their doors. Carville told the men he didn't need maintenance work because his house was a state home and Housing NZ did the repairs. Another older couple further down the street said a man knocked on their door a month earlier, saying he had noticed two tiles had fallen off their roof. The man promised he could fix the tiles for less than $900. However, the couple wondered how he could quote a price without taking a closer look and so contacted their regular roofing company Solar Chem Roofing for advice. He said he was contacted in December by the family of another elderly woman wanting advice after she was duped out of more than $10,000 by two guys with Irish accents. "When I knocked on the door, and this guy opened it, he was very alert, very confident," the neighbour said. "He had answers ready on the tip of his lips." When asked for identification or a business card, the two men present said it was in their car. But instead coming back with their ID, they fled.